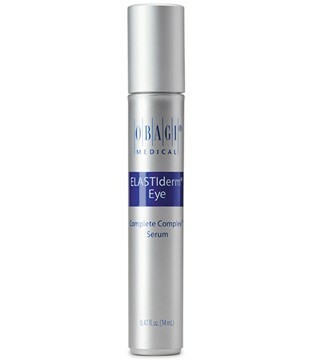 Obagi ELASTIderm Eye Complete Complex Serum 0.47oz. Strategically combats the problematic signs of aging around the delicate eye area. The Obagi ELASTIderm Eye Complete Complex Serum strategically combats the problematic signs of aging around the delicate eye area. Active ingredient Malconic Acid helps rebuild the elasticity to alleviate bags under the eye area, as well reduce puffiness that can hinder the appearance of healthy, bright looking skin. Caffeine is another ingredient present in the ELASTIderm Eye Complete Complex Serum that actually reduces the appearance of dark circles under and around the eye area for a more vibrant, energetic look and feel. The Obagi ELASTIderm Eye Complete Complex Serum further astonishes with its innovative roller ball technology that allows an easy and effective application that helps smooth and reduce puffiness while allowing the serum to deeply penetrate the skin. Incorporating the Obagi ELASTIderm Eye Serum in a daily skin care regiment will greatly reduce crow’s feet, fine lines and wrinkles, puffiness and dark circles around the eye area, and help achieve the ideal youthful, bright, smooth look. You're reviewing: Obagi ELASTIderm Eye Complete Complex Serum 0.47oz.